For the past several years, Fitterman has been exploring a poetics of "sampling," taking the practice of collage and procedural writing into the computer age, away from the edgy, splice-based works of Ashbery's Tennis Court Oath and Berrigan's Sonnets, to something akin to the seamless web of cut-and-paste in music composed with digital tools. Such minimal, often "ambient" pieces give the impression that, with the right algorithms and a limitless database, the poem could potentially go on forever and never repeat itself. 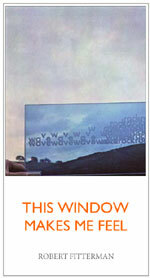 This Window Makes Me Feel, like "Flarf" and Google poems, is based on sentences collected from search engines, but Fitterman creates a rich, understated emotional core to the work by the repeated motif of the title phrase, which balances on the delicate irony that something generally considered "invisible" (i.e. transparent) has become the subject of a civic meditation. The dedication to the victims of the World Trade Center attack seals this work as a response to trauma, a spiraling reaching-out to a wall of stability which, to the eye, had never been previously remarked.